As the 1980s closed out, horror movies found themselves in a very weird place. The slasher craze had run itself into the ground with self-parodies of characters like Freddy and Jason, and the MPAA began cracking down harder than ever before to aid the growing power of big studios at the multiplex. Red-soaked, monster-friendly outings were soon sequelized and given a heavy injection of goofiness, as witnessed with wildly varying degrees of success in the follow-ups to Evil Dead, Re-Animator, Return of the Living Dead, Child's Play, and so on, with even all-new efforts like Society and Dr. Caligari drenching their stories in weird, Day-Glo late '80s satire. Perhaps the wildest of them all, the two Basket Case sequels arrived eight years after the original with director Frank Henenlotter shooting them back-to-back (along with Frankenhooker), replacing the gritty, comic gore of the 1982 classic with broad, cartoonish freak show visuals and rib-tickling humor straight from the consciousness of a caffeine-addled junior high monster fanatic. 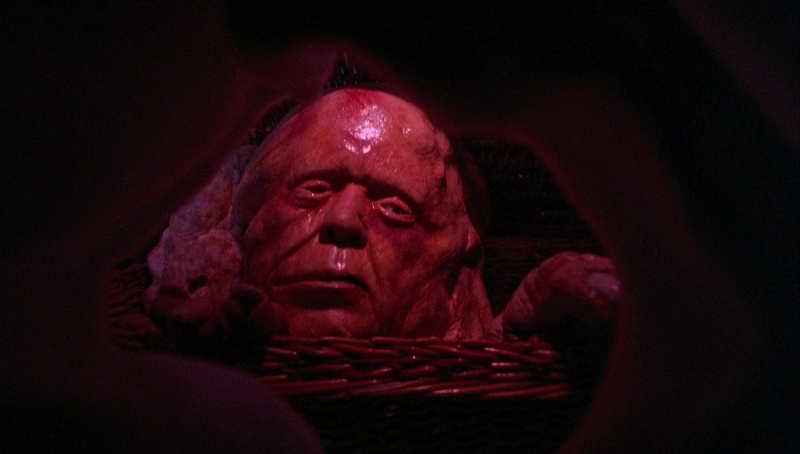 Basket Case 2 will completely baffle anyone who doesn't remember the dawn of straight-to-video mainstream horror, but it's a unique, highly eccentric entry in the horror sequel sweepstakes all the same. 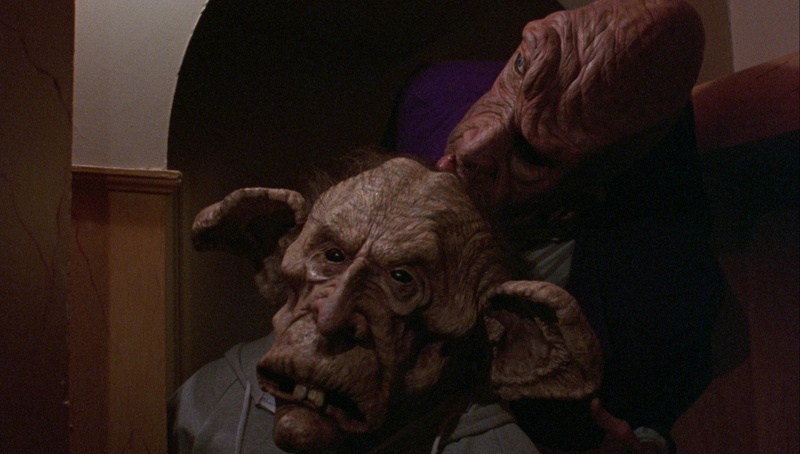 Our story picks up with the closing moments of the original Basket Case as Duane (Van Hentenryck) and his deformed, separated Siamese twin brother, Belial, plunge from the neon-accented awning of their seedy New York hotel. The ensuing media frenzy reveals their grisly secret life to the public, so their protective aunt, "freak's rights" activist and writer Granny Ruth (Ross), spirits them away to her remote mansion where she houses a wild menagerie of freaks. 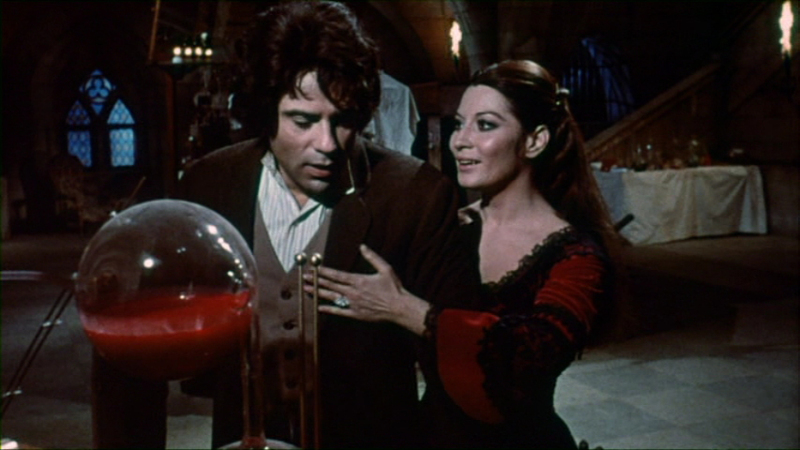 Belial soon falls for Eve, a similar freak (with whom he couples in a scene unlikely to leave viewers' memories for weeks), while Duane becomes apprehensive about his status as the only "normal" person around except for Granny's daughter, Susan (Rattray). Meanwhile a snooping tabloid reporter (Meisle) follows the brothers' journey and tries to infiltrate the haven, with utterly grotesque results. 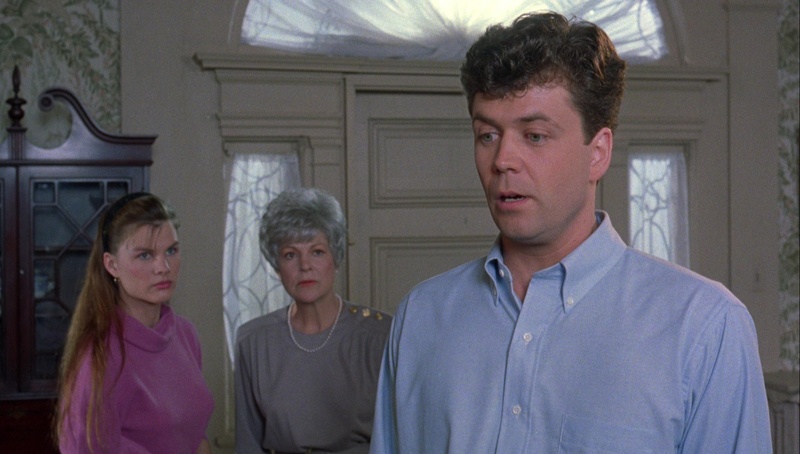 Fast-paced and utterly strange, Basket Case 2 veers way over the top early on with Ross' impassioned speeches while dressed in quasi-religious white gowns, surrounded by mutated inhabitants with faces resembling moons and tree stumps. 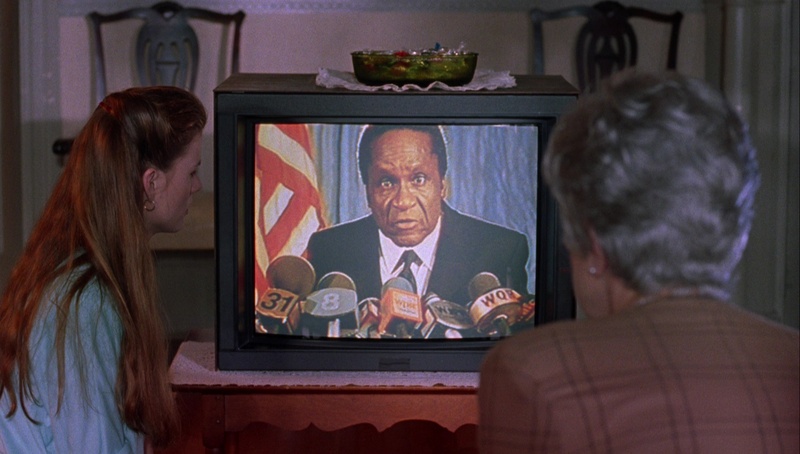 The influence of Jerry Springer tabloid culture is unmistakable here and gives the film a nice twist; while the gore is kept to a surprising minimum (this time out the MPAA easily gave it an R rating), the barrage of outrageous make-up effects keeps viewers off balance from start to finish. Van Hentenryck gives an assured comic performance (even doubling as Belial's face in some shots this time out), and Henenlotter follows up his psychedelic Brain Damage by getting even more stylized and extreme with his lighting and camera angles. Top it off with a catchy score by Joe Renzetti (Dead and Buried) that can only be filed under "quirky" and a memorably sick little ending, and you've got an instant cult favorite. Ushered to home video by Shapiro Glickenhaus back in the early '90s after a handful of token theatrical screenings, Basket Case 2 disappeared from view for nearly a decade afterwards when the DVD era hit (though a mediocre-looking UK release popped up pairing it with the even more absurd third installment). Synapse's 2007 DVD restores much of the brightly-colored luster to the film that couldn't be appreciated on a home screen before, and that goes ever more for the 2016 Blu-ray, featuring the same extras. (A UK Blu-ray is also included in a trilogy steelbook release and looks very similar a/v-wise.) The wild color schemes really pop here like never before, and the anamorphic presentation looks terrific. Also, the stereo soundtrack is more spacious than expected with the music rising up quite effectively during the opening clips from the mono, flatly-recorded original. FX artist Gabe Bartalos hosts the biggest extra, a 20-minute featurette entitled "Behind the Wicker." Packed with camcorder footage of the creation of Belial and the other freaks, it's a fun, low-tech short with Bartalos (who has to be subtitled on occasion due to the loud industrial setting) showing off the shooting locations, sharing a chatty walk with Henenlotter while talking about the shooting, and turning the camera over for a reminiscence with Henenlotter and Jim Glickenhaus. Dawn of the Dead's David Emge pops up for the second featurette, a five-minute quickie called "The Man in the Moon Mask," in which he talks about how he landed up appearing in his memorable and completely unrecognizable role as "Half-Moon." Updated review on July 22, 2016.